The Red Sox pounded out 14 hits in a 4-3 win over the Orioles in the rubber game of their 3-game season-opening series at Camden Yards. 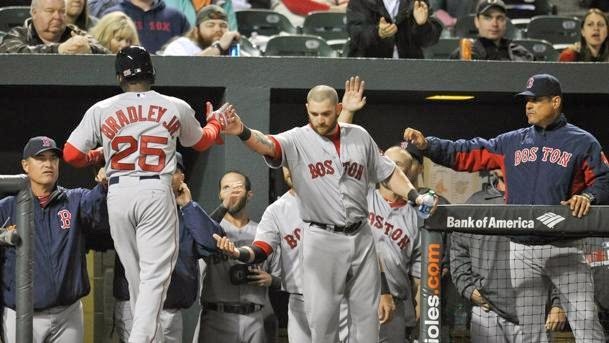 David Ortiz and Xander Bogaerts each had 3 hits; Will Middlebrooks and Jackie Bradley Jr. each had a pair. Boston scored first in the top of the second inning off Baltimore starting pitcher Wei-Yin Chen when Bogaerts scored on a double play ground out by Middlebrooks. Ortiz made it 2-0 an inning later when he lofted a single into left field that scored Jackie Bradley Jr. (pictured) all the way from first base. Bogaerts scored again in the top of the fourth inning on an RBI single by David Ross. The Orioles chipped away for two runs in the bottom of the fourth on an RBI double by Matt Wieters who subsequently scored on a single by Delmon Young. Boston and Baltimore each added single runs in the sixth inning. The Red Sox were just 2-for-10 with runners in scoring position, leaving a combined 21 runners on base. Boston starter Felix Doubront was charged with 3 runs on 6 hits over 5.1 innings; he walked 1 and struck out 4 in earning his 1st win. Koji Uehara came on in the 9th for his 1st save of the 2014 season on his 39th birthday.